We knew we wouldn’t have time to finish up the water and propane systems before leaving for our first planned journey, so we got down to work on the other essentials, now that wheels were on. First up was our lower bedroom walls, so we could build in a bed. 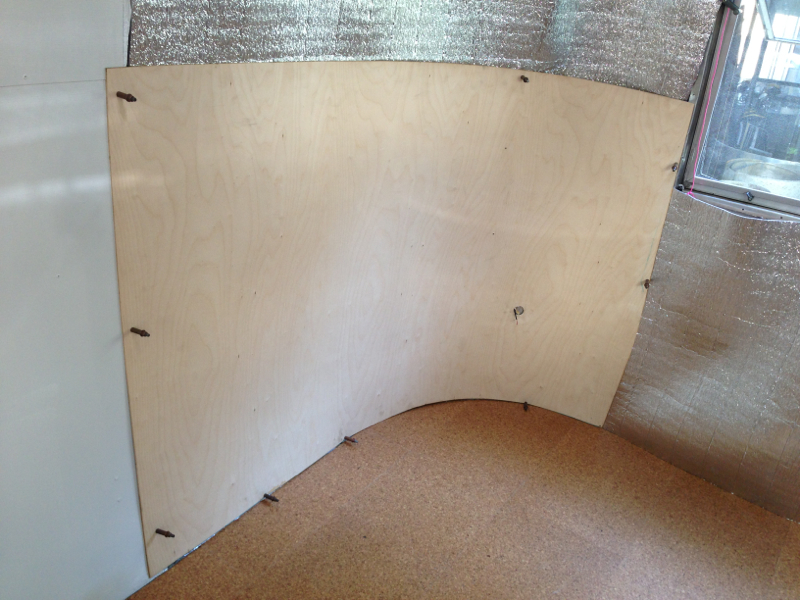 The old walls in the ends of the trailer were made of molded fiberglass (which had many cracks, holes, and were caked with years of grime), and we wanted to improve upon the design and make our trailer feel more like a home by building them out of wood. It was challenging – to say the least – to find the perfect shape to match that curve in the floor and wall simultaneously! Making paper templates didn’t really help because of paper’s flimsiness versus wood. We were able to eventually get pretty close by templating and making further adjustments on the fly, and they’re starting to really look nice. To expedite our work and help us with the tricky bits, we hired a great carpenter and cabinet maker to help us build a lot of the interior furniture. When you’re at the mercy of walls that are curved in multiple directions and are terrible at geometry, asking for a little help to save yourself hours of frustration isn’t a bad thing! 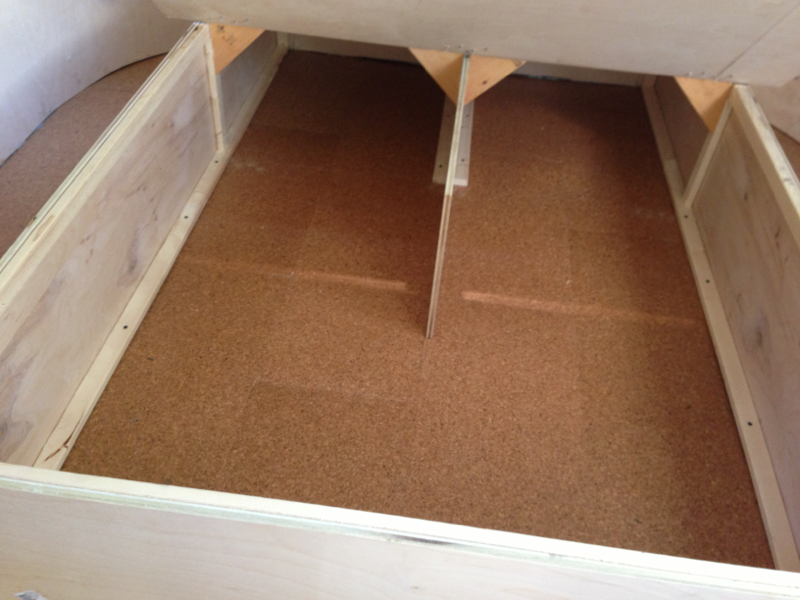 While we worked on installing plumbing lines, our carpenter installed our platform bed with storage beneath, and our bedside tables. The tables were built from reclaimed pieces of the original 1965 mahogany cabinets. 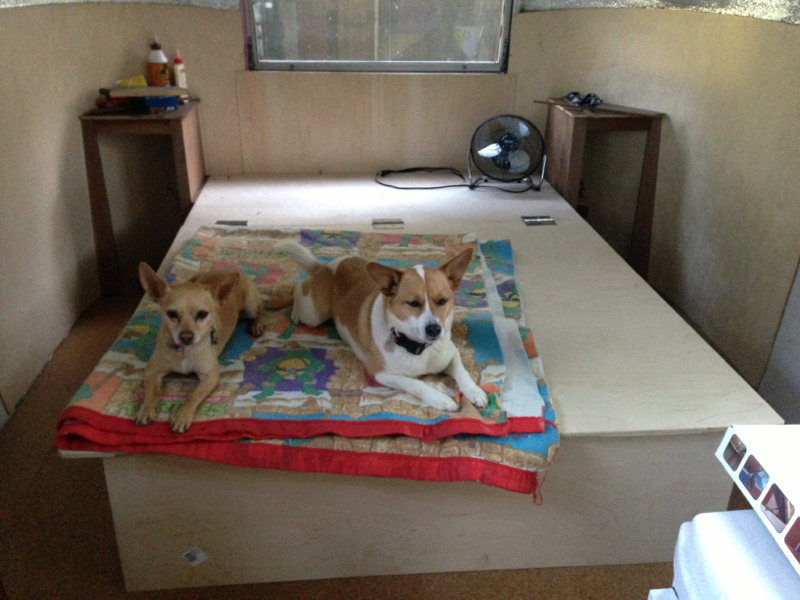 We’ve been lucky and very excited to reuse most of the original cabinet doors, upper cabinets, and various pieces of hardwood from the old sofa and bed to build a lot of the new furniture in the trailer. It’s beautiful wood, and environmentally- and cost-conscious in lieu of buying new. 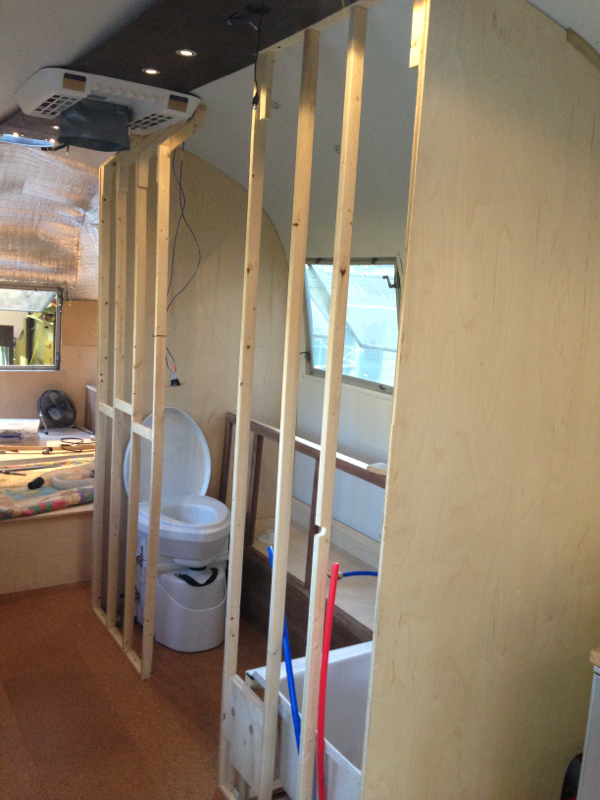 The bathroom wall framing has gone in as well, after receiving our Nature’s Head composting toilet and new bathtub and dry-fitting them into place, a bathroom cabinet is framed out, and soon we’ll have kitchen cabinets as well! Previous Post Now We’re Rolling!